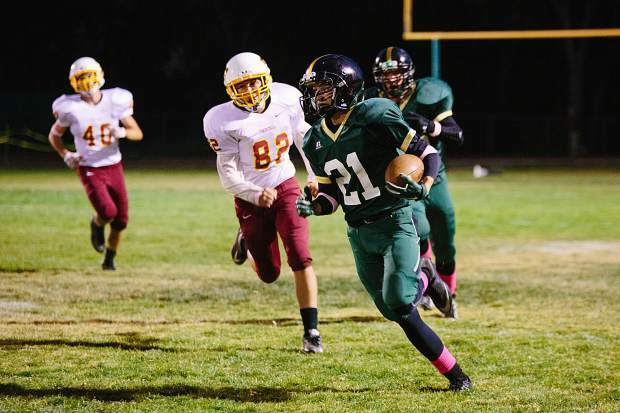 Incline Village’s Conor Nix may have gotten a late start to his football career, but by the time he reached his senior year, he had emerged as one of the Highlanders’ top players. Now Nix is looking to take his game to the next level in an attempt to walk-on to San Diego State University’s football team. Nix finished his time at Incline High School as a three-sport athlete, and was a state track and field qualifier in high jump and pole vault. He also maintained a weighted GPA of 4.2, achieved the rank of Eagle Scout, was a member of the National Honors Society, and was honored by the school with the Eric Hays Award for dedication to the community, athletics and academics. This fall he will attend SDSU, where he’ll look to walk on to the Aztecs football team. For Nix, the hard part wasn’t getting into college, instead, it was settling on one of the seven universities he was accepted to. In the end, it came down to two colleges, SDSU and the University of Colorado Boulder. The factor that tipped the scales was something that was unforeseeable for Nix three years ago — a chance to play collegiate football. According to team coaches, football wasn’t on Nix’s radar until his sophomore year of high school. He showed up for those first practices weighing around 115 pounds and didn’t see a lot of time on the field. But by his senior year, Nix had bulked up and was the focal point of the Highlanders’ ground attack as a halfback in the team’s Wing-T offense. Nix said he believes that football’s attention to discipline has made him better in the classroom, and a better person off the field, calling football “the ultimate team sport,” and said that the life skills learned on the gridiron have refined his ability to complete group projects while also ingraining the notion of personal responsibility. During Nix’s sophomore year on the team, he latched onto senior standout tight end Ben Snyder, who would later successfully walk-on to Stanford University’s football team. Seeing Snyder walk-on at Stanford provided motivation that Nix could do the same, prompting him to create a highlight film after his senior year, and to start cold calling coaches at universities, sometimes up to twice a day, until he would get a response. After gaining some notice from a few smaller programs, Nix was able to touch base with coaches at SDSU and CU. Nix then met Offensive Coordinator and Running Back coach, Jeff Horton, on a visit of San Diego State. Horton’s honest assessment of Nix’s skills and his candor about Nix’s chances of making the team as a walk-on were the deciding factors. Nix officially enrolled at the university soon after. At 5 feet, 11 inches and around 160 pounds, Nix, who also played in the Highlanders’ secondary and on special teams, said he plans on working out in Reno over the summer to add extra pounds of muscle as he prepares himself for a chance to make the Aztecs’ team during tryouts in late August. SDSU finished last season as the Associate Press No. 25 ranked team and were the Mountain West Conference champions for the second year in a row. The Aztecs concluded their season with an 11-3 record, and a 34-10 win over the University of Houston in the Las Vegas Bowl. The team will open play on Sept. 2 at home against University of California, Davis. If Nix can earn a spot on the team, he’ll be able to look forward to a reunion with Snyder when SDSU hosts Stanford on Sept. 16. Reporter Justin Scacco contributed to this report.